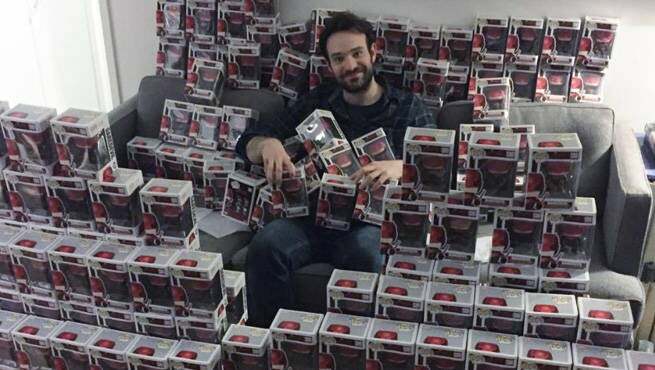 Charlie Cox must have been a little surprised when well over a hundred Daredevil Pop's showed up at his door. The actor had asked toymaker Funko if they could send some Daredevil Pop's for him to take to various hospitals and schools, and they more than obliged. After receiving the large haul, he posted a tweet saying: "Charlie Cox asked @OriginalFunko for a couple @Daredevil Pop!s to take to hospitals & schools—here's what they sent!" Nice work Funko, nice work. The actor is about to start work on Incognito, an off-Broadway play. While a thrid season of his hit Netflix show Daredevil is expected, it hasn't been announced yet. Recently the actor did touch on the much-anticipated Defenders project that will start shooting sometime later this year. "What we do know is at the end of this year we’re going to be making The Defenders and, of course, Daredevil is very much a part of that foursome. I have no idea what the storyline is going to be for that show," Cox cautioned. "I'm very excited to see how those worlds combine, and interested to see tonally how those shows become one." Fans are interested too, and hopefully, we will see some new information on the new series soon.